The E-Series is a series of robots created by Dr. Eggman. They were first introduced in Sonic Adventure, comprising mostly of gunner robots. 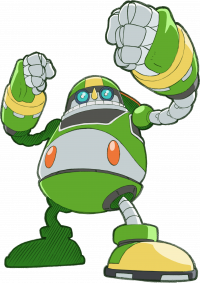 E-102 Gamma, an E-series bot from Sonic Adventure. 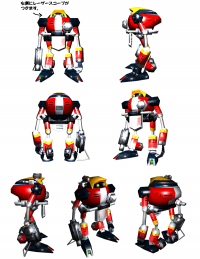 Unlike many of Eggman's robots in previous games, the E-100 series were important characters in their own right. The most prominent was E-102 Gamma, who was a playable character during the game. The others served as bosses, with the exception of the mass produced Egg Keeper, which is a standard enemy robot. Egg Keeper A mass produced robot that captures the player with energy rings. Said to be an E-100 Series robot in the instruction manual. In Sonic X, Beta replaced much of Zeta's role. So much, in fact, that Zeta only appears on the show in Episode 31, "Revenge of the Robot", when Gamma comes to the Hot Shelter to destroy him. An E-1000 in Egg Quarters. E-1000 - The E-1000 models resemble E-102 Gamma with two cannon arms. They shoot like crazy and seem to lack any higher awareness. E-123 Omega - Playable character. 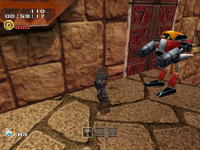 E-2000 - Red or yellow armored robots with laser guns. E-2000R - Tougher, golden versions of the same. Mostly confined to Final Fortress. E-121 Phi - Gray copies of Emerl, the Gizoid. Chaos Gamma - A partial rebuild of E-102 Gamma with two weapon arms; may or may not count as part of the E-Series. Sonic Riders included the E-10000 series; two of which, E-10000R and E-10000G, were unlockable playable characters. E-10000R - A red humanoid robot wearing what appears to be a baseball cap. E-10000G - A mass produced green version of E-10000R. E-10000Y - A maintenance robot in Ice Factory. E-10000P - Purple robots seen on a production line in Egg Factory. E-10000G - Returning from Sonic Riders. E-10000B - A blue version of E-10000. Part of Team Dark and only playable in World Grand Prix mode. Revealed to be Metal Sonic in disguise. This page was last edited on 2 September 2017, at 00:32.